Is Memorial Day weekend just another holiday, or does it mean something more to you? While this weekend simply signifies a long awaited prelude to summer for some, it is much more than that for others. As a veteran and lifelong student of leadership I have always found Memorial Day weekend to be one of the most meaningful and significant of all holidays. In the text below I’ll share why I believe all business executives can learn valuable leadership lessons from those in uniform. 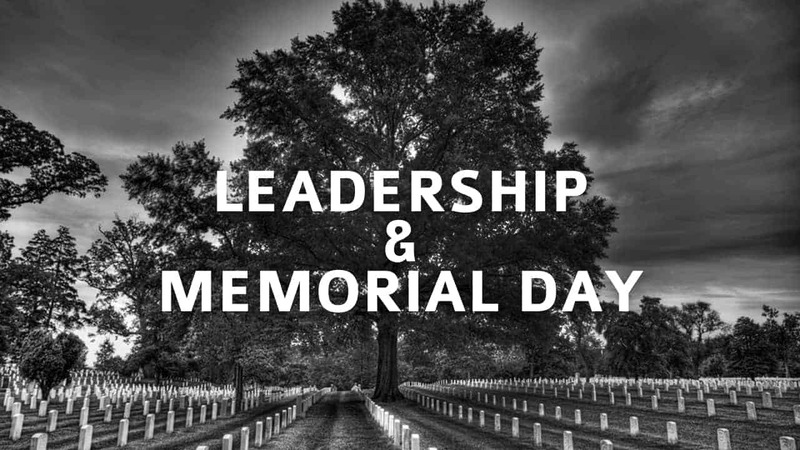 Memorial Day not only provides great opportunity for introspective reflection, but the stories of what constitutes great leadership surrounding this holiday are frankly too numerous to count. The more I reflect on the courage and heroism of our military (past and present), the more I realize the same characteristics present in the heart of a warrior are nothing short of a blueprint for success with respect to the leadership traits that should also be present in our business leaders. There is nothing more special than someone who gives of themselves for others, and nowhere is this more evident than with those who serve in the military. There is also no better example of leadership than what you witness taking place as a matter of routine on military installations and in areas of operation around the globe. Of course there are notable exceptions, but they in fact do remain the exception and not the rule. While it is clearly not necessary for an executive to have military experience to be an effective leader, I would submit that today’s business leaders would do well to possess the characteristics of a warrior in their pursuit to become better leaders and to build better organizations. Commitment, passion, attention to detail, discipline, service above self, honor, integrity, perseverance, compassion, the ability to both lead and follow, to execute with precision, and the ability to adapt, improvise, and overcome are representative traits possessed by successful military leaders. From personal experience I can absolutely guarantee you that these same traits will serve you well as a business leader. The characteristics mentioned above will allow you to inspire and lead with a focus and commitment not present in DNA of those leaders who don’t possess a warrior’s heart. It is the ability to stay mentally focused on achieving the mission at hand, regardless of circumstances, that will help you take your organization to that next level. While the following may not be politically correct, I believe it nonetheless represents the truth – it also takes guts to be a leader. Our military represents our nation’s best – they are motivated, committed, passionate, honorable individuals with a clear sense of duty, and who hold in high regard the principle of service above self. Let’s face it, it takes a unique individual to knowingly and willingly walk toward a life threatening situation placing his/her life at risk in order that other lives may be saved. Our military embodies the character, sense of duty, commitment, and the values our nation was built upon. How many of you would choose to make an uncompromising stand on your principles and values if you knew the outcome would result in certain death? Examine the most successful business leaders and you’ll find they possess this same zeal – they don’t see their leadership role as just a job, but rather they view it as a passion; a calling if you will. Moreover, it is those leaders who receive the negative press, those leaders who just can’t seem to get the job done that universally seem to be void in some or all of the aforementioned traits. There are many so-called management gurus in today’s politically correct world who would take great exception to what I’m putting forth in today’s post. They would tell you that the classic strong leadership traits that define our nation’s best military leaders are outdated and they don’t display a proper amount of empathy and compassion. They could not be more wrong – strength and compassion are not mutually exclusive terms. The strongest leaders are in fact the most compassionate leaders. Examine any great military leader and their troops sleep before they do, eat before they do, and they are cared for before they are. A leader’s greatest responsibility is not for his/her own glory, but it is for the well being of those whose care has been entrusted to them. While not all great business leaders have served in the military, those of you who have worked to develop the leadership traits mentioned above understand the advantages you derive from a having a military leadership state of mind. Thank you to all who have spilled blood. All that have given the ultimate sacrifice. To all that have buried a grandfather, grandmother, husband, Wife, father, mother, brother, sister, daughter, or son. I am sorry for your loss and thank you from the bottom of my heart for living a life of sacrifice and for seeing a world beyond you; one of freedom. Hi Zech – thanks so much for sharing the heartfelt sentiments. I know those reading your words will be appreciative of them. Bravo Zulu Mike! I am in step and give my thanks to the great leaders in the Armed Forces today and everyday. We are fortunate to live in the greatest country in the world and we owe our freedoms to those willing to serve. Thanks Monte – appreciate you stopping by. Hi Mike, I love to read your posts. Is it possible to receive the full post text in my e-mail? It makes it easier for me to read your blog. From an Active duty veteran of 4 combat tours I will say HOOAH! You hit the nail on the head! Where and when did you serve?